Sebastian Quotes. . HD Wallpaper and background images in the Sebastian Michaelis club tagged: sebastian michaelis kuroshitsuji. 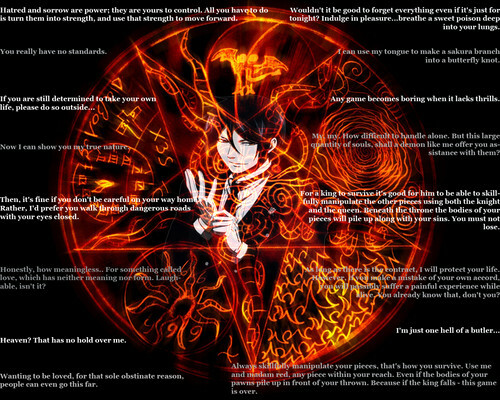 This Sebastian Michaelis wallpaper contains anime, comic book, manga, and cartoon. The background is very eye catching and intense. Thanks! Turned out better than I expected the background to but by then I already had all the quotes on it. Otherwise, I think I would have just kept the background and used a different one for the quotes. Ah, well, sometimes that's what happens. It looks great though.